Irdeto acts in the best interests of our customers, shareholders, and employees. 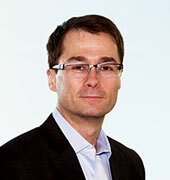 Maarten Koning is the Chief Financial Officer and is responsible for finance, including procurement, facilities and tax. 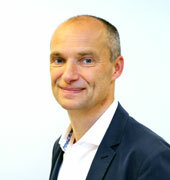 Maarten joined Irdeto in December 2010 as VP of Finance. In this role, he was responsible for all aspects of the company’s finance operations, FP&A and treasury functions. 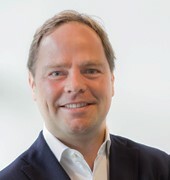 Prior to joining Irdeto, Maarten worked for Pace, now part of Arris, and Philips in a variety of international roles, including strategy development, M&A and business unit finance positions. 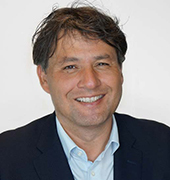 Maarten has extensive international experience, having lived in France and worked on M&A, transformation and operations projects in the UK, the US, South East Asia and China for longer periods on end. He graduated with honors from the University of Tilburg, The Netherlands. As SVP of Human Resources at Irdeto, Frank focuses on making Irdeto a great place to work and ensures that the company is creating a culture that attracts and inspires the world’s most passionate talent. He leads Irdeto’s Global HR Team in building teams, developing people and delivering an outstanding employee experience. 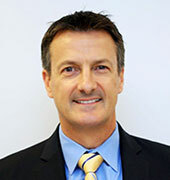 Frank previously served as Hitachi Vantara’s Vice President of HR for the EMEA Region and the Global Supply Chain Group. He was deeply involved in supporting the organization as it went through a major digital transformation while also supporting business leaders to further grow and optimize their business. Prior to this role, he led the EMEA HR Team for NetApp. The company proudly ranked number one on the 2015 list of Best Multinational Workplaces in Europe as published by the Great Place to Work organization. The list is based on employee ratings of their workplace culture, including the pride they take in their jobs, the camaraderie they experience with co-workers and level of trust in leadership. Frank’s experience also includes time at Microsoft where, as a Senior Director, he specialized in talent management and business partnerships. In this role, he led HR for Western Europe and grew the organization through talent acquisition. He started his career in the airline industry as a Director of Passenger Services and Cabin Crew. 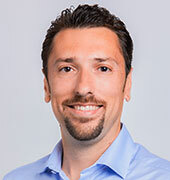 Frank earned a degree in Economics from Vrije Universiteit in Amsterdam, specializing in innovation, organizational development and change management. 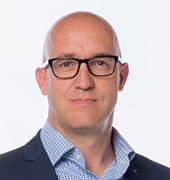 Niels Haverkorn joined Irdeto in 2018 as General Manager, Connected Transport to accelerate the development of Irdeto’s thriving connected transport security business. 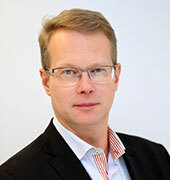 An expert on the business of connected platforms and services, he joined Irdeto from Volvo, where, as Vice President of Business Platform Services and Solutions, he was responsible for developing and leading digital strategy for Volvo Construction Equipment. 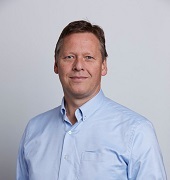 Prior to joining Volvo, Niels held a variety of global leadership roles with Phillips, where most recently he was General Manager of the mobility solutions global business unit. In this capacity, he and his team developed various smart ADAS (Advanced Driver Assistance Systems) solutions for the automotive and mobility markets. Melt Loubser has more than 25 years of experience in the video entertainment market. 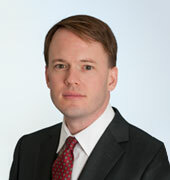 He is currently the Vice President of Broadcast Managed Services at Irdeto. In this role, he leads the Irdeto Broadcast Managed Services team, which provides expert support and professional management of the pay TV Operator’s Head-Ends, Networks, Conditional Access Systems and VOD/OTT content preparation and protection systems. 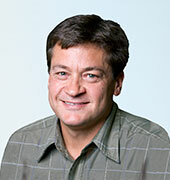 Prior to this role, Melt was General Manager for Broadcast Technology at MultiChoice Africa and was responsible for all of the broadcast platform operations and engineering within the Group that offers video entertainment content across multiple platforms (Analogue, Direct to Home Satellite, Digital Terrestrial Television, Digital Terrestrial, OTT and IPTV). He also led the implementation of all new technologies within MultiChoice Africa. Irdeto is committed to environmental responsibility, which is evidenced by its architectural and interior design and energy utilization principles in its Netherlands office, as well its focus on finding innovative ways to deliver “greener” solutions to the market. Irdeto’s office in the Netherlands was designed and built with the environment in mind. Located just opposite Hoofddorp train station, the building is equipped with bike racks and showers to encourage employees to use environmentally-friendly modes of transportation. Designed by MIII Architects, this sustainable 10,000 sq. m. office building meets the GreenCalc-score B.
MIII and Irdeto developed the building with a strong focus on sustainability, flexibility and future scalability. The charcoal-colored brick pedestal elevates the building and can accommodate 200 vehicles in a two-story car park. The building is sculpted into three wings, each six stories high, with a centrally-located atrium that features a wooden curtain wall that covers the concrete construction. The wooden curtain wall is made from 100% sustainable Western Red Cedar.The carpeting and inside wall coverings utilize post consumer-recycled content, reducing the amount of trees and other natural resources used in the manufacturing process. Where possible, Irdeto sourced local vendors for other materials like furniture and tiles, reducing transportation costs and by-products, further lowering the company’s carbon footprint. Compact fluorescent lighting with high intensity reflectors also minimize the amount of energy used. Lighting requirements are offset by the many windows throughout the building, and the large skylights in the atrium, restaurant and mezzanine areas. Floor-to-ceiling windows provide sweeping views of the surrounding terrain, showcasing the relationship between natural and fabricated materials. 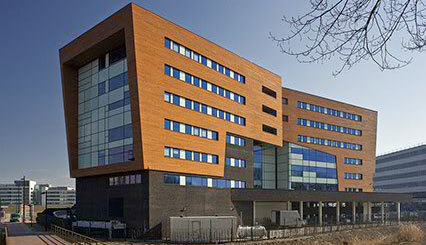 This eco-friendly building is the perfect design contrast to the digitally-oriented, high-tech company it houses. Irdeto supports the European Union’s voluntary agreement on energy saving, in addition to the voluntary agreements in the U.S. and Australia. Irdeto also participates actively in industry forums to further the energy saving cause, and offers a sound strategy and practical approach to help our customers become “green” with both new and existing deployments. One great example of Irdeto’s green initiative is Irdeto Cloaked CA, an innovative card-less software security solution that delivers the same level of uncompromising security as a smart card, for protecting digital TV content. Smart cards, commonly used in pay TV and other security-critical industries, are built from layers of plastic, electronic components, copper and gold among other materials. Many toxic substances such as glues and solvents are used in the production, assembling and packaging of smart cards, and transporting cards between locations and distributing them to end users also require significant logistical efforts and resources, and produce waste. All this leads to a significant amount of energy usage and waste, which clearly has a negative impact on the environment and incurs costs for operators. While Irdeto’s strategy has always been to help operators renew security over the air on deployed smart cards to keep them in the field for as long as possible, it is common in the pay TV industry for conditional access (CA) providers to leverage card swaps as a way to update security. Irdeto estimated that more than 78 million cards were swapped globally by pay TV operators in 2011, and as many as HALF A BILLION cards would be swapped from 2011 to 2015. As a smart card weighs six grams each, the estimated number of swapped cards in five years represents nearly 3500 tons of waste — comparable to 300 mature elephants! As a cardless solution, Cloaked CA eliminates the energy and waste associated with smart card production, distribution and disposal. Being “green” does not mean any compromises on the “cool factor”, either, as security updates, new features and functionalities for Cloaked CA can be easily downloaded over the air to the device on both one-way and two-way networks. With Cloaked CA, Irdeto fully redefines the traditional pay TV security approach, significantly reducing the carbon footprint compared to a smart card solution. See how pay TV operators such as Stofa and Mega Media are using Cloaked CA, Irdeto’s fully renewable, software-based conditional access solution, to ensure uncompromising security for their pay TV services. Irdeto conducts its operations according to world class standards in order to ensure its products and services attain high levels of quality and security. Irdeto conducts its operations according to world class standards to ensure its products and services attain high levels of quality and security. This is supported by the implementation of an ISO 9001 certified Business Management System providing a framework for processes driving the company’s strategy and objectives. This framework of ISO 9001 international standard enables Irdeto to constantly enhance customer satisfaction through continual improvement of its processes. Irdeto’s implementation of the standard is regularly audited by an external certification body. While the ISO 9001 certificate covers our DTV Business Line, the process and principle are applied across the organization. Irdeto was the first foreign manufacturer to receive Class A SART certification from the Chinese State Administration for Radio and Television (SART). The certification mandates increased levels of specification for providers of conditional access (CA) systems in the areas of reliability, security and scalability.